J took me here on our outing at Sinsa-dong's Garosu-gil, a street full of clothes shops and coffee shops and op shops, in a word a girl's dream come true?! Well, with this tiny sandwich shop, my hungry stomach's wish certainly did come true. Boy, was I glad, because this noon feast was my first meal of the day. It was all the more satisfying because I had just passed the first crazy night out in Seoul. The bread here is exceptional. Chewy, flavoursome, fragrant. J told me that the place was often crowded, and why would this day be any different? We had to sign up on the waiting list, but luckily the wait wasn't long. She had a taco chicken sandwich. I had a seafood one. Yum. Yum. Oh my delicious. 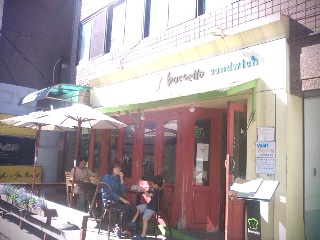 The sandwich place serves as a small bakery on the side as well. The chef has a pastry diploma from Cordon Bleu, but not sure if that extends to general bread making. Anyhoo, not too fussed, I was just glad for the bread quality.